We don’t write humanities monographs for riches. We may do so in an attempt to earn academic fame. But the career kickback for me was rapid promotion. In the humanities, the monograph’s the thing. With digital publishing comes the uncoupling of content from print: why should those six years of work (or more) result in only a physical book that sits on a few shelves? Why can’t the content be made available freely online via open access? Isn’t this the great ethical stance: making knowledge available to all? Won’t opening up access to the detailed, considered arguments held within humanities monographs do wonders for the reputation and impact of subject areas whose contribution to society is often under-rated? The humanities’ dependency on the monograph for the shaping and sharing of scholarship means that scholars – and publishers – should be paying attention. How will small print runs of expensive books fare in this new “content should be available for free” marketplace? How will production costs be recouped? The latest Jisc survey on the attitudes of academics in the humanities and social sciences to open-access monograph publishing makes an interesting contribution to this debate, showing how central single-author monographs remain to the humanities, and how important the physical – rather than digital – copies are. People still like to read, and in many cases buy, them. The monograph is still the thing: anyone who wants to be taken seriously as a scholar in the humanities should work towards having one. Open-access requirements are on the horizon, so broach them with the publisher. Don’t accept £10,000 costs. Brandish this survey, and say “people still buy books”. There are many possible futures for the scholarly monograph. Ultimately its fate is not in the hands of university presses, which have struggled to keep it alive in spite of declining readership. (Academic libraries have likewise struggled to support the monograph despite falling circulation.) The future depends on whether scholars themselves value the monograph enough to keep reading it. If so, funding models for monographs can and will be found. The full interview can be read at http://chronicle.com/blogs/profhacker/what-is-the-future-of-academic-publishing-an-interview-with-gita-manaktala-from-mit-press/41335. Ever since the University of Missouri announced on May 24 that it was closing its Press, university presses have been generating quite a bit of discussion. In the last few days several items of interest have appeared. On July 6, The Iowa City Press-Citizen interviewed Jim McCoy, the director of The University of Iowa Press, about the future of the UI Press (“University presses seek out new roles and new markets”). McCoy said “we have an incredibly supportive administration who understands that we fill a necessary function. … We bridge the gap between research and teaching.” He also noted that they are very small in terms of people but publish a far higher number of books per staff member each year than other presses. He emphasized the value of working with the UI Obermann Center for Advanced Studies, Prairie Lights and The UI Libraries. Inside Higher Ed published an opinion piece on July 9 by Marshall Poe of Iowa’s history department (“What Can University Presses Do?“). Poe would like to see presses move towards open access publishing and new modes of outreach. This item generated quite a few comments from people familiar with university presses and is worth reading for the responses it has generated. those that editors seek to add to authors’ pieces not because they are needed, but to make various journals appear more influential. Many people use various measures of journal influence that are based on counting how many times journals’ articles are cited — so extra citations yield a more influential journal. A boycott of Elsevier journals has been growing to show opposition to their support of the Research Works Act and their 36% profits (see Research Bought, Then Paid For – an Op-Ed in the New York Times, Elsevier boycott gains momentum, Elsevier responds to the boycott, and “Of goats and headaches”–The Economist on journal publishing for previous posts on these issues ). There have also been prominent articles about the lack of public accessibility of academic research, such as “Locked in the Ivory Tower: Why JSTOR Imprisons Academic Research” which appeared in The Atlantic on Jan 20, 2012. This particular article points to JSTOR as an example of the “broken economics of academic publishing”. Nancy Sims from University of Minnesota wrote “Academic publishing is full of problems; lets get them right” which is a good response to the Atlantic article, correcting some of the specifics. Please note that the JSTOR figure is for back content (the so-called moving wall), not current issues. The following chart offers another way to view the relative size shares of the pie different publishers receive from our acquisitions budget (the denominator for these percentages is total spending on e-journals). The data is slightly older than that used above. Fitzpatrick continues by identifying the support from an adviser as more critical. This support continues through helping graduates in their first jobs explain to senior faculty about their work. “Too many young digital humanists find themselves cautioned away from the very work that got them hired by well-meaning senior colleagues, who now tell them that wacky digital projects are fine on the side, or once the work necessary for tenure is complete. Twenty-two universities and colleges have formed the Coalition of Open Access Policy Institutions (Coapi) to “collaborate and share implementation strategies and advocate on a national level for institutions with open access policies”. See http://www.news.ku.edu/2011/august/3/openaccess.shtml for more information and a list of participating institutions. JSTOR is opening access to everyone for their pre-1923 journals in the United States (pre-1870 elsewhere), making them freely accessible to the public. These articles come from more than 200 journals and total close to half a million articles, about 6% of the total JSTOR collection. The content can be re-used for non-commercial purposes. When searching JSTOR, you can limit your search to “only content I can access” in the advanced search. The Early Journal Content will be marked with the word “free”, along with other content that is freely available. A short video tutorial on accessing the content is also available. The content will be released on a rolling basis over the next week. Not all pre-1923 content will be made available by JSTOR. We thank JSTOR for making the Early Journal Content freely accessible. The Guardian has a short opinion piece on academic publishers, calling them “the most ruthless capitalists in the western world”. The author, George Monbiot, compares spending £1 for 24 hours of access to the Times with a per article cost ranging from $31.50 for an individual Elsevier article to $42 for a Wiley-Blackwell article. 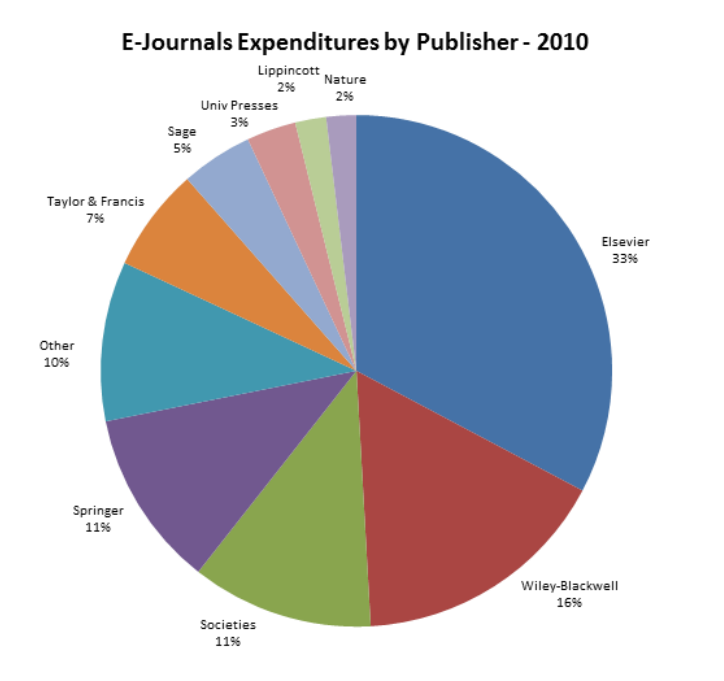 He notes that journals are now 65% of library budgets (we spend a similar percentage at The University of Iowa). Elsevier’s profit margin was 36% in 2010, the same as in 1998, demonstrating that this is not a new phenomenon. Elsevier, Springer and Wiley have bought smaller publishers, so they now account for 42% of journal articles, including many with the highest impact factors. While this issue is bad for researchers at universities, it is even worse for independent researchers who would need to purchase each article separately. Monobiot concludes with the suggestion that all publicly funded research be made openly accessible (as is current practice with NIH funded research) and that there would be a single global archive of academic literature and data funded by library budgets with money diverted from the private publishers.